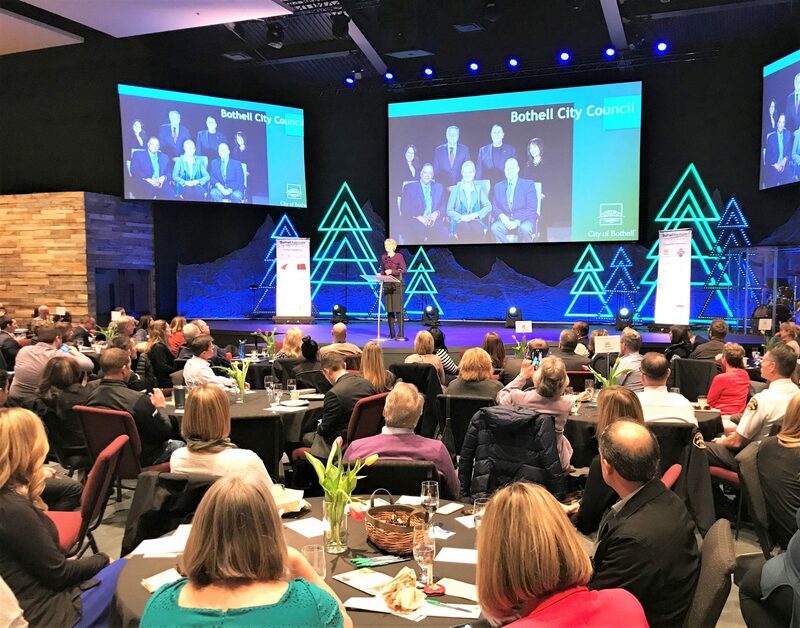 On January 16 the Chamber was pleased to host our annual State of the City of Bothell Luncheon with guest presenter Jennifer Phillips, Bothell City Manager delivering the address. Over 175 local business owners, professionals, and civic leaders gathered at the spacious Evergreen Church auditorium to hear the address, connect and network, and enjoy a delicious lunch catered by Alexa’s Cafe & Catering. The Chamber wishes to thank all who attended, City of Bothell City Manager Jennifer Phillips and Mayor Andy Rheaume for speaking, Evergreen Church, Alexa’s Cafe & Catering, all our volunteers and Ambassadors, our musicians Randy Mac Music, our community information contributors: Friends of North Creek Forest, Friends of Youth, and Clothes For Kids; and of course our sponsors: Community Transit, Puget Sound Energy, Junction, The 104 Apartments, and Viridian. Congratulations to Levi Gettleman of Bothell High School on receiving our Student of the Month Award. And thank you to JD Davis of Sundance Energy Services for sponsoring our Student of the Month. Event Photos can be viewed here. Video of the State of the City Address can be viewed here. Mark your calendars for our State of the City of Kenmore Luncheon on March 13. Tickets are on sale now!